When did you become a randonneur and what drew you to the sport? After re-discovering the bicycle in 1996, I discovered that I liked riding long distances. Randonneuring was an accidental discovery. 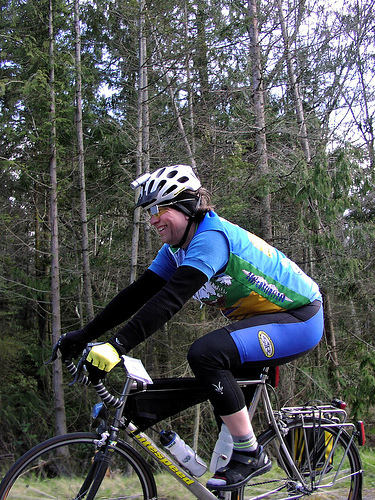 In 1998, my goal was to ride RAMROD and I joined the sponsoring Redmond Cycling Club. In the RCC newsletter, I saw a notice for a 200km brevet sponsored by the Seattle International Randonneurs. It seemed a long way to ride so early in the spring, but I signed up. I met some great folks on and after the ride, which ended at a member’s house. I was lured back, against my better judgment, for the 300km, then the 400km, then the 600km. Hooked, I headed for Paris-Brest-Paris the next year and have been riding randonneur events since. Challenging, often scenic rides and the camaraderie of a great international community of riders keep me coming back. Tell me about some of your best or most memorable brevets? I’m an easy mark. Often the best brevet is the one I just finished. Looking back, I’d say that my three visits to Paris-Brest-Paris have been superb. One major appeal of randonneuring for me is sharing the experience with the community of randonneurs around the world. In addition to PBP, I have enjoyed riding other 1200km “grand randonnees” in different countries. When participating, for example, in the Perth-Albany-Perth in Australia last year, I experienced different scenery, rode along the Indian and Southern Oceans, and had the chance to chat with riders from Australia, England, Canada, Sweden, Holland, and Norway, many of whom I already knew. Earlier last year, I had a quite different and equally extraordinary experience riding the first ever 1200km brevet in Asia, held on Hokkaido in northern Japan. As the only participant from outside Japan, I enjoyed coping with the unfamiliar language, food, road signs, etc while doing something very familiar. Mark in volunteer mode. Photo from the Seattle Rando flickr. Inversely, what was the worst experience you’ve had during a randonee? Or if not the single worst, at least a good story about a crappy ride. I’ve certainly had my share of less than stellar brevets. Heat exhaustion on a 600km in central Oregon. Torrential rains and deep fog that turned a scenic 1000km to Crater Lake into a slogfest (never saw the lake). Rides that I DNF’d for one reason or another. One that stands out: After a difficult season in 2008, I abandoned my plans to return to British Columbia’s Rocky Mountain 1200 in the summer of 2009. Instead, I set my focus on a return engagement with the Great Southern Randonnee in Australia (which I had DNF’d in 2001). A key preparatory ride was a difficult 600km brevet up to Windy Ridge on Mt. Saint Helens and then over White and Chinook passes. Rolling into Packwood at the very back of the field, the riders accompanying me chose to abandon the ride. A poor choice of food and general lack of conditioning sent me puking all the way up White Pass (under a beautiful moonlit sky) and dozing off all the way down. Sitting on a water jug that was a control on the dark side of Rimrock Lake, I could only barely convince a good samaritan in a pickup truck NOT to rescue me and drive me to shelter. Miraculously, however, a 40 minute nap in Naches brought my own Lazarus miracle and I finished the ride with a terrible finishing time, but a renewed confidence that I could complete the upcoming 1200. Despite having roots in late-1800s France, organized randonneuring is a relatively new thing in America. How have you seen it grown since you started? 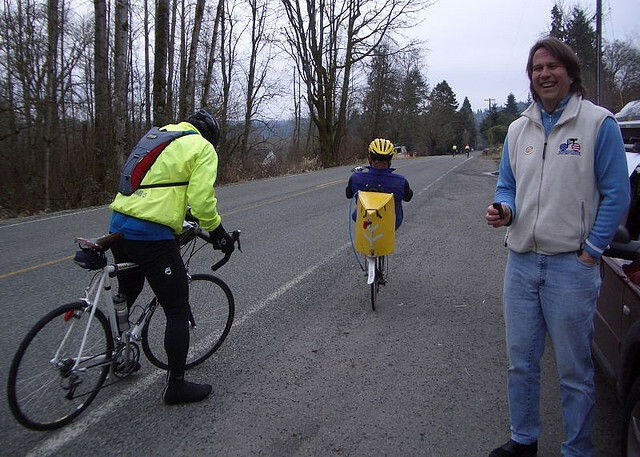 When I started, there were a few year-in, year-out randonneurs that I met in Seattle and around the US. 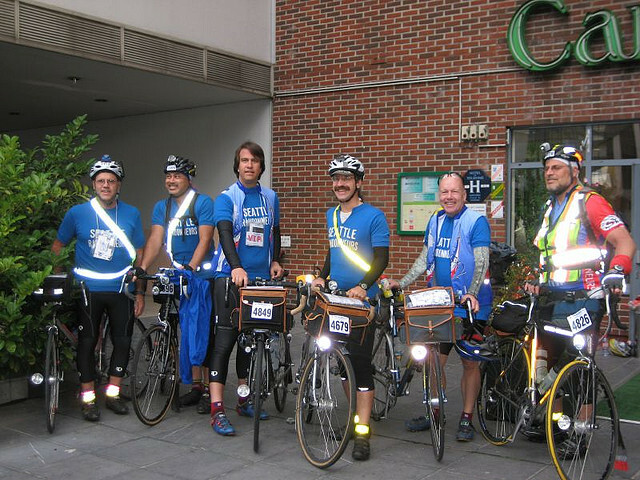 Most riders, however, seemed to focus on Paris-Brest-Paris, which had only seen its first modern American participants in 1975. The sport ebbed and flowed in a quadrennial rhythm marked by PBPs. Only one 1200km grand randonnee existed in the US. Brevets were held in relatively few places in the country. Now we have a much larger group of riders in the US for many of whom randonneuring itself is the goal, not PBP. Riders participate in brevets and permanents year-round and in many more places. In 2011 alone, riders will have five 1200km options in the United States – in Texas, Virginia, Colorado, Alaska, and North Carolina. Photo from the Seattle Rando flickr. What makes Paris-Brest-Paris the preeminent randonee? Over a hundred years of tradition. A challenging ride, a big reunion, and a celebration of long-distance cycling all rolled into four days with thousands of fellow riders from all over the world cruising through the French countryside to the cheers of friendly local residents. As someone whose spent a lot of time organizing events and running RUSA and SIR, what needs to happen for randonneuring to continue to grow in the U.S.? I’d like to see us continue to offer more opportunities, in more places, to participate in the sport. We need to offer great rides that keep existing riders coming back year after year. We should never lose sight of the spirit of camaraderie that characterizes our sport and distinguishes randonneuring from other more race-oriented cycling pursuits. We welcome new riders and encourage them to participate deeply as riders and volunteers and to find a style of riding that works for them within the broader rubric of randonneuring – whether they ride fast and light or mosey along in tourist mode or find their own way somewhere in between. This entry was posted in Interviews, Randonneuring and tagged mark thomas, randonneuring, randonneurs USA, RUSA, sammamish valley cycles, seattle international randonneurs, SIR. Bookmark the permalink.